Eight is the first sleep fitness company. Eight leverages innovation, technology and personal biometrics to restore individuals to their peak energy levels each morning. Backed by leading Silicon Valley investors including Khosla Ventures and Y Combinator, it was named by Fast Company in 2018 as one of the Most Innovative Companies in Consumer Electronics. Although it feels nice in the moment, hitting the snooze button is essentially postponing and putting the rest of your day on hold. Whether you want to be more productive or are just tired of running around the house to get ready every morning, it's time to address the primary way many people sabotage themselves at the start of the day. Hitting snooze—although it seems like a blessing when you're exhausted—is actually hurting your sleep quality as those extra 9 minutes don't provide any benefits since it's not enough time for a sleep cycle. Instead, all you're doing is postponing the inevitable, and you'll be even more groggy when the alarm goes off again. Creating this cycle of hitting snooze every morning is a bad habit that far too many people have. You’re essentially training your brain to recognize the alarm as the cue to hit the snooze and sleep more rather than to wake up. This fragmented sleep can also negatively impact your waking hours and hurt your sleep the next night. And the last thing you want is to be lying awake in bed unable to get any rest—it’s about as bad as waking up overheated with night sweats. So, what can you do about your snooze-hitting habit? Luckily, with these tips and a little bit of discipline on your part, it’s a feasible habit to break. If you keep your alarm on your nightstand within arm's reach, then reaching over and slapping the snooze button is way too easy. To fight against it, put your alarm across the room if not in an entirely different room altogether. Once the alarm sounds, it'll force you to get out of bed and move, which can help wake you up. If you feel like you're just too tired when you wake up every morning, the primary issue might be poor sleep fitness. If you aren't getting 7-9 hours of sleep every night, it's no surprise that your body craves more every morning. Start adjusting your nighttime habits so you can get adequate sleep every night and you'll wake up feeling more refreshed rather than groggy. How nice would it be if you could gently wake up every morning ready to get out of bed and face the day? Fortunately, companies like Eight Sleep provide the tools you need to sleep better so you wake up ready for the day ahead. As you are aware, the body goes through different cycles while you sleep and there are different levels of sleep depending on your body temperature. If you are in REM sleep, then you'll find that waking up is much more difficult; however, if you're in a lighter sleep, then waking up is easy. To help implement this, a smart bed from Eight Sleep with a built-in smart alarm will track your sleep cycles and will gently wake you up using temperature when you're in a lighter state of sleep. Sometimes at precisely 7 a.m. when the alarm is set, you're in a deep sleep but at 6:45 a.m., you're not. The Pod, Eight Sleep’s newest smart bed, will track your cycles and will wake you up precisely when you're in the lightest sleep within 30 minutes of your set wake-up time. Eight Sleep is on a mission to promote the long-term health benefits of getting a great night's rest and to improve your sleep fitness so you can be more productive and feel more awake during the day. The Pod is their latest product, a smart cooling bed that will help you fall asleep faster and stay asleep longer all while it coaches you to become more sleep fit every night. Eight Sleep employed cutting-edge technology when creating the Pod and leveraged sleep data from people across the world to develop sleep solutions that provide real results. Whether you struggle to sleep or just want to optimize your waking hours, Eight Sleep has the solution for you. Whether you're travelling for work or fun, one thing is for certain: Jumping time zones can wreak havoc on your sleep schedule if you aren't careful. Sleep schedules are fairly sensitive for many people and shifting your sleep times by even just a few hours can take a few days to adjust. While you're going to notice a little bit of disruption if you are travelling overseas, you can keep it to a minimum and fight off the dreaded jet lag if you're proactive and strategic. So, if you want to avoid waking up with night sweats several days after you return, here are a few tips to keep your circadian rhythm in check and stay as sleep fit as possible while traveling. How long you'll be staying at your destination can significantly impact what you should and shouldn't do to stay sleep fit. In general, it takes around two days to adjust your sleep schedule to a new time zone fully. So, if you're only there for a day, then it's not quite worth readjusting and you should generally stick to the sleep schedule you’re used to and adjust as needed to fit the needs of your trip. If that’s the case, if possible, try and schedule meetings or other obligations during your home time's equivalent waking hours. If you’re going to be at your destination for a bit, then the best way to adapt to the local time is to start while you’re at home from the comfort of your smart cooling bed. To help adjust, three days before your departure date, start going to bed an hour earlier/later than usual and wake up an hour earlier/later the next day. It’ll take some time your sleep cycles to adjust, and while waking up 6 hours earlier may not be feasible before you’re heading overseas, adjusting your cycle three days beforehand should at least ease the abrupt time difference. If you'll be staying at your destination for more than two days, then your best option for adapting to the local time (in addition to prepping ahead) is to just go with the flow. If you're landing at night, stay awake on the plane so you can hit the hay as soon as you check in. If you're landing in the morning, then do the opposite. Although it might be a struggle at first, it'll help you adjust more quickly and make the most out of your time there. If sleep fitness is a priority for you at home, don’t use this work trip or vacation as an excuse to let yourself go and hurt your progress. While you might want to continue watching what you eat and getting as much exercise as the hotel gym allows, you should also keep your bedtime routine intact. Everyone is different, but some best practices include avoiding electronics or screens an hour before bed, using your blue light wave-blocking glasses as needed, and not consuming caffeine in the late afternoon or evening, etc. By sticking to your sleep fitness routine, when you get home, you’ll have an easier time getting back in the swing of things and resting soundly. Eight Sleep is on a mission to promote the long-term health benefits of getting a great night's rest and to improve your sleep fitness so you can be more productive and feel more awake during the day. The Pod is their latest product, a cooling smart bed that will help you fall asleep faster and stay asleep longer all while it coaches you to become more sleep fit every night. Eight Sleep employed cutting-edge technology when creating the Pod and leveraged sleep data from people across the world to develop sleep solutions that provide real results. Whether you struggle to sleep or just want to optimize your waking hours, Eight Sleep has the solution for you. Are These Daily Habits Hurting Your Sleep? Along with oxygen, water, and food, sleep is one of the essential components of life that everyone needs. Unfortunately, far too many people get poor-quality sleep. Some awaken in the middle of the night with night sweats while others toss and turn throughout the night. Consequently, many of us aren’t as productive and energized the following day. If you've struggled with getting quality rest at night, there are simple steps you can take to try and fix it. In fact, your daily habits could be affecting your sleep without you even realizing it. Here are some common bad habits to look out for and correct for better quality rest every night. While smart phones, tablets, laptops, and other screens are essential devices for daily life, once bedtime rolls around, staring at these screens can negatively impact your quality of sleep. Scrolling through social media, sending texts, or playing a game on your phone are all highly interactive activities, and before you can drift peacefully to sleep, your brain needs time to shut down. When you stare at your phone screen, you’re disrupting that process, and keeping your brain from powering down for the night. So, instead of having a relaxing scroll before bed, read a book, meditate, or listen to calming music or nature sounds and drifting off sleep will be easier. One of the most disruptive things for your body is to have an inconsistent sleep schedule. Many of us are guilty of staying up too late during the week and sleeping in on the weekends, but this inconsistent sleep schedule can wreak havoc on your body's natural circadian rhythm. Your body craves consistency in your sleep schedule, and when you go to bed and wake up at the same time every day—even on weekends—you can lead a well-rested life. This will also make Monday morning’s alarm not be so daunting (although you should work toward getting enough sleep so you can wake up naturally). Coffee, energy drinks, some teas, and even chocolate all pack caffeine. And though caffeine can be great for powering up during the morning, if you like to sip on caffeinated beverages well into the late afternoon or evening, it’s probably hurting your sleep. That’s because caffeine has a half-life of 8-10 hours, which means that at 10 p.m., your body is still processing half of the caffeine from your 2 p.m. latte. Some people think that they are immune to caffeine, and while they might be able to sleep soundly with caffeine flowing through their system now, as we age our bodies metabolize caffeine slower, which means it’s more likely to stay in our system and keep us up at night. This is why a late cup of coffee might keep you awake now even though it didn’t use to. Regardless of which camp you’re currently in, start paying attention to when and how much caffeine you consume and be mindful of the time so you’re not left wide awake in bed at night—now or down the line. Your sleeping environment, specifically the ambient temperature and your bedding, can have a significant impact on your sleep quality. Experts recommend sleeping in temperatures between 60 to 67 degrees Fahrenheit, but if your room is naturally hot or you have a heat-trapping mattress, you're probably familiar with the struggle. To fix this, either lower or raise the temperature on your thermostat, turn on a fan, or open a window to help reach the ideal range. You can also look into upgrading your mattress. 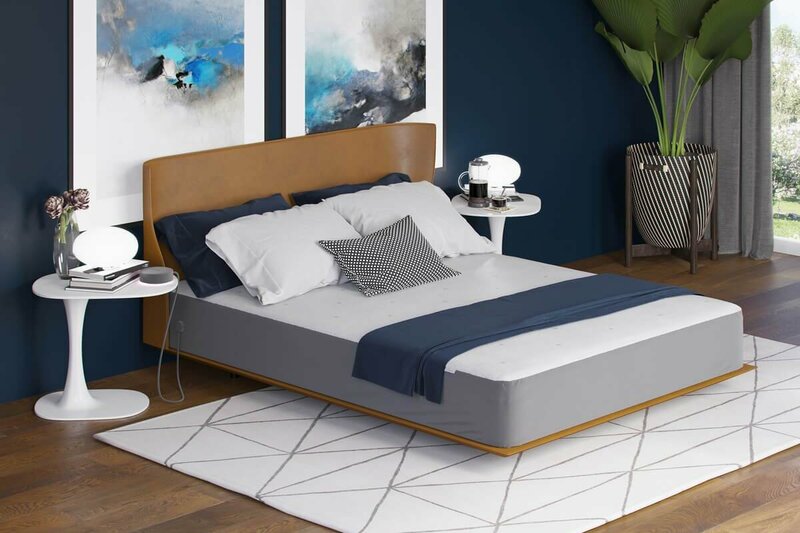 Sleep fitness company Eight Sleep, for instance, has created a smart bed that offers advanced temperature regulating technology to help you sleep cooler and stay asleep throughout the night. Eight Sleep is a company dedicated to helping people achieve optimal sleep fitness through their unique and innovative sleep solutions. Their most recent product, the Pod, is a smart cooling bed that brings premium comfort along with sleep coaching technology to help you become more sleep fit. When you improve your sleep fitness you can wake up every day feeling more recharged, refreshed, and ready to conquer your goals. Eight Sleep leveraged biometric data from sleepers across the world in developing their products and they offer a 100-night sleep trial, so you can sleep on it before committing. The humble mattress has come a long way in recent years, and companies are finding new and inventive ways to bring technology into the bedroom via smart beds. But, as with almost everything in life, not all smart mattresses are created equal. Here are the top features and attributes that you should consider when shopping for a new smart bed. First things first: No matter how much technology is packed into the mattress, it should be effortlessly comfortable and made using premium materials. Many smart beds are made using memory foam, but not all foam will be as comfortable as others. You should look for a smart bed that utilizes multiple layers of adaptive foam that will gently cradle your body while providing adequate support for your pressure points so you can rest easy in any sleeping position. Also, look for additional touches like a protective cover along with a top layer that perfectly molds to your pressure points and lets your body breathe rather than trapping heat. Beyond premium comfort, your new mattress should have smart features to back up its “smart” branding. The best smart bed companies will use cutting-edge sleep fitness technology in the construction of their mattress, making you wonder how you spent so many years on a bed without integrated technology. For example, Eight Sleep offers a smart mattress that features innovative dynamic temperature control powered by water to keep the bed at the ideal temperature range between 55- and 115-degrees Fahrenheit. This feature will help keep you cool as you sleep so you can forget about waking up with night sweats. Their smart bed also includes a thermo alarm that gently lowers the temperature once your wake-up time is close. Finally, on your journey to becoming sleep fit, you should choose a smart mattress that will record and show you your sleep data, so you know how well you’re sleeping every night and if you need to make any changes. Some of the best smart beds will work with an app on your phone, so it’s easy to access your data and understand what steps you should take to consistently sleep better. Speaking of improving your sleep, being sleep fit is just as important as being physically fit. No matter how much you can lift in the gym or how often you run, if you aren’t sleep fit, you won’t be nearly as alert and productive during your waking hours. You should choose a smart bed that not only promotes optimal sleep fitness but that will also coach you to success. The best smart bed will offer a program via a mobile app that will train you to become more sleep fit. From changing your daily routines to setting a consistent bedtime that allows you to get a full night’s rest every night, look for a smart mattress that prioritizes your sleep fitness. Finally, your new smart mattress should connect seamlessly with the other devices you have in your smart home. For example, your smart bed should be able to connect to your digital assistant like Amazon’s Alexa so you can ask “How well did I sleep last night?” and get an immediate answer. The best smart mattresses will also connect to your thermostat system to control the heat or AC system and change the ambient temperature based your sleeping temperature. Is your bedroom a sleep paradise? It’s something that many don’t consider when arranging and setting up their room, but it’s crucial. When it comes to sleep, some assume all that's necessary is a bed, a pillow, and a blanket, but if you continuously feel groggy during the day and need four cups of coffee just to make it to lunchtime, it's time for some changes. Along with going to bed around the same time every night (including weekends) to ensure you’re sleeping for 7-9 hours a night, other factors in your bedroom can significantly impact your sleep quality. If improving your sleep fitness is a goal for you, or you're just tired of feeling exhausted during the day, follow these tips to make your bedroom a sleeper’s paradise. In life, there are some things that you can afford to skimp on—your bed isn't one of them. You'll spend nearly one-third of your life in bed, so if you are willing to spring for leather seats in your car where you only spend an hour or two a day, why not invest in a premium mattress? Over the last few years, mattresses have come a long way and sleepers around the world are experiencing the difference that a new, high-quality mattress can make. Look for one made with premium materials and advanced comfort features like a cooling bed function that regulates your body temperature as you sleep. Along with a premium mattress, the sheets and other bedding on your bed can impact your sleep fitness. If you're using old, low thread count sheets or have too many blankets and pillows, for example, you could overheat during the night and experience dreaded night sweats. Upgrade to 100% organic cotton sheets that are incredibly soft and cool to the touch so you can sleep more soundly and more comfortably all night long. These days, screens and electronic devices can seem inescapable, with many of us scrolling social media before we check out for the night. The problem is that the harsh blue lights emanating from smartphones, computers, and TVs aren’t doing our natural circadian rhythms any favors. To combat this in your new sleep paradise, create a spot away from your bed dedicated for your device(s) at the end of the night. Ideally, you’ll want to avoid screens entirely a few hours before bedtime, but when that’s not possible, having them out of reach when you’re in bed at the very least will prevent any late-night scrolling that could hinder sleep patterns. Along with a cooling mattress, there are a few more bedroom accessories you can try to help get a better night’s sleep. A pair of blue wave glasses can block out blue light waves from your work computer or smartphone at night to fight against the circadian rhythm-disrupting light waves. A cooling pillow will also help you sleep more comfortably with the "cool side of the pillow" feeling all night long. And a durable foundation will give your bed an excellent base to rest upon. Last, you should always employ a dependable mattress protector that’s waterproof so your mattress stays fresh and clean. To get better sleep, your goal should be to treat every night as you treat a workout. Make sure that you have the right tools and that you’re using time wisely, so you can power down before bed and get the rest you need. By following these steps and sleeping on a premium mattress you’re sure to improve your sleep fitness and notice a difference in your daily life. Eight is an innovative company dedicated to improving the sleep fitness of people around the world one night at a time. They offer advanced sleep fitness tools like their smart bed with cooling technology to ensure you sleep cool throughout the night so you can wake up recharged, refreshed, and ready for the day. Using cutting-edge technology, biometrics, and sleep data from people across the world, Eight’s line of products is ready to help you improve and reach your sleep fitness goals. Getting a full night’s sleep is essential for people across the world. Without it, you'll start to experience adverse effects in your daily life—and trying to repay your sleep debt on the weekends isn't a viable solution. Waking up in the middle of the night with night sweats, to use the bathroom, or just to stare at the ceiling when we can’t fall back asleep are problems that impact many of us. But why do you keep waking up during the night—and is there a solution to fix the problem? Let's take a closer look as some common sleep issues and ways to improve your sleep fitness. Why Do You Keep Waking Up? Having trouble sleeping is a common symptom of anxiety, according to the Mayo Clinic. If you know that you have anxiety, this likely isn’t news to you. But even mild forms of anxiety, certain degrees of stress, or having something worrying you can have you tossing and turning throughout the night. Although getting a good night's sleep might seem as simple as having a bed, a pillow, and a snuggly blanket, your sleeping environment can play a tremendous role in the quality of your nightly rest. If your bedroom is too hot, too cold, too noisy, or too bright, staying asleep throughout the night can be a challenge. Having a nightcap isn’t all too uncommon, but it can significantly impact your sleep fitness. Even though it might seem like alcohol can help you drift off to sleep, it’s more typically associated with stage one sleep, where it’s easier to awaken because of environmental factors. If you've slept on an older mattress for quite some time or you just have never gotten used to your bed, you can probably sense that it may be impacting the quality of your sleep. There are many more reasons that can interrupt your beauty rest, but these are among the most common. Now that we've identified some problems, here are some tips to help fix them—and finally reclaim your full night's worth of restful sleep. If your sleeping environment is the issue, adjusting your thermostat is the best first step. Experts recommend sleeping in an ambient temperature of 60-67 degrees Fahrenheit. If your room situation doesn’t afford that or you want to go the extra mile to ensure quality sleep, investing in a cooling mattress that absorbs and dissipates ambient heat will help you sleep more soundly. If the morning sun seeps into your room or street lights outside your window keep you awake, look into blackout curtains also. Regarding alcohol consumption, everyone processes it differently, but if you find that you can't sleep after a nightcap, adjust your habits and allow at least three hours after the last beverage for optimal sleep. Finally, if your bed is just uncomfortable, the only way to effectively and ultimately fix the problem is to invest in a better, smarter mattress. It’s definitely a worthwhile investment, especially when you consider the amount of time you’ll spend in bed throughout your life, as well as the impact a great (or poor) night’s rest has on your well-being. Optimally, you should choose a bed that includes innovative smart features so you can track your sleep over time and take steps to improve your sleep fitness. Eight is an innovative company dedicated to improving the sleep fitness of people around the world one night at a time. They offer advanced sleep fitness tools like their smart mattress with cooling technology to ensure you sleep cool throughout the night so you can wake up recharged, refreshed, and ready for the day. Using cutting-edge technology, biometrics, and sleep data from people across the world, Eight’s line of products is ready to help you improve and reach your sleep fitness goals. If you’re like many people—especially at the start of a new year—you do everything you can to be as healthy as possible. You sweat away hours every week in the gym and watch your diet to make sure that you're physically fit. But have you ever considered your sleep fitness? Sleep fitness is essential, and if you're not getting enough sleep or the quality of your sleep is poor, you'll experience the effects during waking hours. To help you improve your sleep fitness, here are some essential items to consider picking up. It's no secret that staring at computer and smartphone screens all day isn't exactly beneficial. Even so, with demanding careers and busy lifestyles, abandoning these screens entirely often isn’t a viable option. Unfortunately, because light exposure is a natural trigger that tells our brain to wake up, exposure to blue light waves can throw off the body's natural circadian rhythm. To combat this, blue light blocking glasses can protect your eyes from harmful bluelight waves so your body can maintain its natural circadian rhythm. Bright light is excellent during the day when you need to be alert, but once it's time to wind down for the night, it can hinder your body's natural ability to drift to sleep. Fortunately, installing dimmable lights in your home is now easier than ever before. Beyond installing a dimming switch, there are smart light bulbs that you can connect to via Bluetooth that can serve as a convenient and easy way to dim the lights. Some even have the option to color shift the light when it's time to get ready for bed. If you live in a neighborhood with a lot of light pollution from streetlights or cars, or work an alternative schedule, you might find that the light outside your window can keep you awake at night. Blackout curtains do precisely as the name implies—they blackout any light from the outside. These simple curtains can keep the light from the outside out of your room, creating the perfect dark environment for restful sleep. If you’ve ever woken up with night sweats, you'll know how unpleasant it can be and how hard it is to fall back asleep. Overheating at night can be one of the leading causes of night sweats, and chances are your bed, pillows, or sheets could be trapping in heat. In a hot bedroom, there’s nothing much better than experiencing the “cool side of the pillow” feeling. Fortunately, there are cooling pillows on the market that can help you experience this throughout the night. Seek out one that incorporates breathable layers to help encourage airflow, and that utilizes a cooling fabric such as nylon. The most important element to improving your sleep fitness is to sleep on a mattress that provides the support your body needs to rest comfortably and recover from the stress of the day. If you feel like your current bed is lacking, thanks to modern technology, you have more options than ever before. For example, a smart mattress with built-in sleep fitness trackers can show you your breathing patterns, tosses and turns, and more data about your sleep so you can make changes to optimize your sleep fitness every night. When paired with your premium mattress, an adjustable base will help you find the perfect position for optimal sleep. Whether you struggle with snoring, circulation, or just can’t get comfortable at night, an adjustable base with multiple positions will help you find the perfect sleep position to minimize your sleep problems and help you take your sleep fitness to the next level. Eight is a company committed to improving the sleep fitness levels of people around the world with their innovative smart bed and other sleep essentials. They consistently leverage innovation, scientific data, and biometrics from sleepers around the world to create products that will help you sleep more restfully every night. The sleep fitness company offers a variety of sleep accessories including pillows, sheets, blue wave glasses, and more, and uses advanced digital technology to help you track (and improve) your sleep over time. Waking up with night sweats is one of the worst feelings. Although there are a variety of factors that can cause them, one significant reason is sleeping in an overly warm environment. Apart from the dreaded night sweats, sleeping in a hot environment can have a host of other adverse effects that can impact your daily life—especially if being too warm is keeping you from experiencing a good night’s rest on a regular basis. Experiencing a cooling sleep environment is optimal for most people. That said, let’s take a look at the benefits of sleeping cool along with some ways to improve your sleeping environment. If you want to become more fit, improving your sleep fitness is an excellent step. Sleeping in a cooler environment can increase the level of “good fat,” more specifically known as brown fat, in your body. With this good fat, your body will burn more calories and improve your metabolic health, which helps with weight loss while also helping to reduce your risk of various metabolic diseases. Melatonin, the natural hormone that helps you drift into a peaceful sleep, sometimes needs support. One of the most effective ways to support your melatonin levels without any supplements or medication is by triggering production through sleep-inducing stimulates. Besides dimming the lights and avoiding smart phone, TV, and computer screens, lowering the thermostat can help too. With improved melatonin production, you can achieve more restful sleep. If you can’t avoid screens late at night, consider utilizing glasses made to block the blue light waves so you can do what you need to while still getting your rest. One of the core factors behind insomnia is sleeping in a hot bed. If you’ve ever tried to sleep in an overly warm environment, then you’re more than familiar with the struggle to fall (and stay) asleep. Warm temperatures, unlike cooler temperatures, can jolt the body awake where cooler temps will allow your body to drift into sleep gently. By reducing the temperature and normalizing, or regulating, your internal temp, falling asleep is easier, and you'll have better chances of staying asleep throughout the night. The most evident way to sleep cooler is by lowering the thermostat in your home. The general recommendation is to keep your bedroom temperature in the 60 to 67 degrees Fahrenheit range. Beyond that, you can turn on a ceiling fan to help circulate air during the night and keep your bedroom cooler, and opening a window can also help create a cross-breeze at night and encourage airflow. During the day, keep your blinds or drapes closed to insulate your room from excess heat buildup during the day. In addition, investing in a smart bed that can help you optimize your sleep fitness and better understand your sleeping habits can help ensure you rest soundly through the night. You’ll also want to reassess your bedding and make sure you’re using 100% organic cotton sheets with a thread count around 300 so your bedding is both soft and breathable. Take a look at your mattress protector as well, as they’re not all created equal. A dependable waterproof protector will help protect your smart mattress from liquids and bacteria—just make sure it’s made with a soft fabric such as Tencel so that it allows for air to pass through for a cool sleep. Last, seek out a pillow with cooling properties such as breathable layers for airflow and a fabric that will help promote a cooling environment, such as nylon. 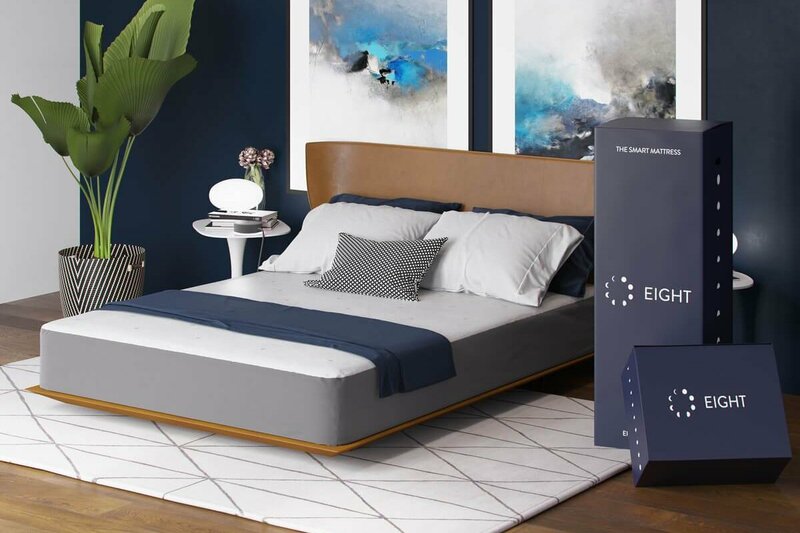 Eight is a company committed to improving the sleep fitness of people around the world with their innovative smart mattress and other sleep essentials. They consistently leverage innovation, scientific data, and biometrics from sleepers around the world to create products that will help you sleep more restfully every night. The sleep fitness company offers a variety of sleep accessories including pillows, sheets, blue wave glasses, and more, and uses advanced digital technology to help you track (and improve) your sleep over time. With a new year right upon us, you're probably ready to kickoff a new workout routine or pick back up the one you started last year. As you assess what you want to achieve in 2019, have you considered what your sleep fitness is? While the results of improving your sleep fitness might not be quite the same as being able to run farther or lift heavier weights, the health benefits of getting better sleep speak for themselves. Whether you wake up with night sweats and need to adjust your environment so you have a bedroom that’s cooling throughout the night, or you just need to determine a reasonable bedtime, here are some tips to help make you a healthier sleeper. Just as you would find a workout routine that maximizes the time you spend in the gym, you should create a sleep schedule that enhances your sleep fitness and performance. You should make sure that you set aside enough time for sleeping, around seven to nine hours, every night and not an hour more or less. You should also limit how much your sleep schedule fluctuates during the weekend to keep your body’s circadian rhythm on schedule. Consider investing in a smart bed that offers innovative sleep tracking technologies to help you get the proper amount of rest every night. Studies show that the ideal temperature to keep your bedroom should be around 60 to 67 degrees Fahrenheit. While you shouldn't be shivering when trying to fall asleep, this ideal temperature zone will help keep you asleep throughout the night without waking up with night sweats. If you are regularly overheating when sleeping, you should consider making some changes to improve your sleeping conditions, such as reassessing your bedding or lowering the thermostat so you experience a cool environment and sleep soundly through the night instead of overheating. It's no secret that staring at computer, TV, and phone screens isn't exactly helpful right before we go to bed. Even so, in the digital age where we work on computers all day for many jobs and face the harsh light of a smart phone screen throughout the rest of the day, it can feel impossible to escape these brightly-lit LED and LCD screens. Staring at lights before bed won't help your body ease into sleep mode and can be detrimental to your sleep fitness. Consequently, you should limit your screen time in the hours leading up to bedtime and choose to read a book or do something else relaxing to help your body naturally and more efficiently wind down for a good night's rest. And, if screens can’t be avoided right before bed, look into glasses that will help block blue light waves, such as The Blue Wave Glasses from Eight, so you can get a better night’s sleep and still do what you need to. More times than not, the mattress you sleep on and your pillows and sheets could be holding you back from achieving your sleep fitness goals. You should feel like your bed is the most comfortable place in the world for you, and if it’s not, you have plenty of options to choose from for a new mattress and accessories. Specifically, to optimize your sleep fitness you’d be wise to invest in a smart bed that tracks and monitors your sleep metrics such as breathing patterns and which levels of sleep you reach every night. The best smart mattress will work with a companion app to then suggest ideas to help you get better night’s rest. Eight’s innovative sleep fitness approach has led them to deliver high-tech products designed to help you sleep better and more comfortably. Their advanced tech products, including their smart mattress, help customers know exactly how well they’re sleeping and how to improve their sleep fitness through useful metrics and suggestions. They partner with scientific advisors throughout product development to develop real sleep solutions that help people enjoy a better night’s rest every night. For many people, exercising regularly and eating healthy is essential to their day-to-day life. Without a morning workout or if they fall off the broccoli wagon for a couple of days, they feel like they aren't quite themselves. Physical fitness and nutrition are hugely important, but although you wake up early to conquer the treadmill, have you considered how your sleep habits could be affecting you? With increasingly hectic schedules in the modern career world, getting the recommended seven to nine hours of sleep a night can seem like an impossible challenge while balancing work and social life. And we’ve all felt the impact of nights where we’ve gotten too little or just the right amount of sleep. Let's discuss a few reasons why you should consider improving your sleep fitness levels. When you spend an hour in the gym every day and then eight hours at work at your standing desk, you’re inevitably used to the feeling of delayed onset muscle soreness or DOMS. DOMS is caused by extensive exercise and is that stiff and sore feeling you have for the next day after a hard workout. While there isn't a precise "cure" for the condition per se, if you want to speed up the process, getting a better night's sleep is a good start. That's because while you’re sleeping, your body lowers its energy consumption and releases natural growth hormones to stimulate muscle recovery and regeneration. So, if you consistently wake up with night sweats or go to bed late every night, it could be negatively impacting your physical fitness, meaning it's time to make some changes. If night sweats are what ails you, then find a way to sleep cooler at night, whether it’s lowering the thermostat, assessing your bedding, or whatever else is needed to ensure a cooling sleep environment. Although you might not be a professional athlete or have dreams of playing sports on the world stage, your athletic performance in the gym, on the trail, or on the court during pick-up games of basketball is still important. As such, it’s worth noting that sleep is a crucial component to the success of professional athletes because it helps improve their concentration, mood, and performance. In one study, researchers found that by increasing the duration of sleep that college basketball players received, they saw significant improvements in speed, accuracy, reaction times, and mental well-being. So, even if making a buzzer-beating jump shot to win the game isn’t a part of your career path, with improved cognitive and physical performance, improving your sleep fitness could help you achieve more in your daily life. Is there anything worse than taking a forced sick day or trying to make it through the work week with a nagging cold? Your immune system is the first line of defense against viruses like the common cold, and when it's not at its best, nagging colds can become a winter-long annoyance. In one study, researchers gave study participants nasal drops with the common cold virus. At the end of the study, they found that those who slept eight hours or more were almost three times less likely to develop a cold than the participants who slept less than seven hours a night. Better sleep can have a lot of benefits, you just need to develop the habits and find the products that help you experience it every night, so you sleep soundly rather than be woken up by night sweats. Eight isn’t your ordinary smart mattress company. Eight is an innovative sleep fitness company dedicated to developing and producing innovative products that help people around the world sleep better and feel better. They partner with scientific advisors throughout product development to create real sleep solutions that help people enjoy a better night’s sleep every night. Eight offers mattresses designed for every type of sleeper, featuring cutting-edge sleep tracking and temperature control.